Note: Copy any of the above Toy Story 3 (Europe) rom download links and paste it into your browser to download. does it work on dstt? Even the decrypted REAL ONE doesn't work!!!! !...i hve a nintendo dsi XL what can i do??? Good for you...what nintendo do u have? i have a dsi xl the new one and it doesn't work! mee too i have an xl and i use an acekard 2i and it doesn't work...is there anyone who can fix the problem?? SAME HERE,A BUTTON DOES NOT WORK,CAN THIS BE FIXED.. Thanks works great on the M3 Real. dos it work on ak2i cards? Most likely you didn't change .nd5 to .nds! Try that! Is someone going to fix for the edge card? does it fix the "A" button problem everyone leeps talking about on level 2? is there a fix for it. Loads on EZ Flash Vi, but A button doesn't work. Actually, this is a half-baked attempt at decrypting the original encrypted rom. CRC32 doesn't even match scene because you missed the last step (copying the decrypted info back into the encrypted rom because eNDryptS corrupted the rom during decryption). Nobody's whining, "A" button doesn't work!!!! Any help with that. Works great, just changed the decrypted one to nds file, woot woot! same here cant get it to work on xl and acekard2 =! 4) on stage 2 If the "A" button doesn't work, just use the NDSpatch 2.03 under the file and it works on any DSi or DSi XL. It works fine on acekard 2i and M33 if patched. please explain how to do it @Jack. where can we find the ndspatch 2.03? I renamed from ND5 to .NDS.. I try to play but i get Can't acces save file. Jack can you please explain where we find the ndspatch 2.03? Are there any copies out there that work on the M3i Zero? I'm solved on my DSLITE/R4 by installing the wood R4 1.10. Now it will work! Hi, on m3 real ds works fine expect for A button: any fix? What's that ndspatch Jack is talking about? See the "Fix A Button For NDS" method posted above. Where is this f*****g NDSpatch 2.03 program? We can't find it on internet. 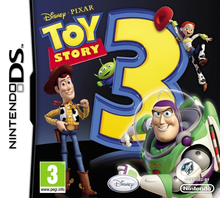 Using the Toy_Story_3_EUR_NDS_WORKING.rar version and A button is fully working. No patches nor anything for EZ Flash Vi.